Larch and Fifth: Theres a second bicycle path, beginning at Larch and Fifth in Sandpoint and heading about two miles west to Dover, built upon an abandoned railroad track. A route has also been extended from that paths terminus at Larch to Boyer, then west about .5 mile to E. Mountain View Drive and then down to Sand Creek, where riders can cross the Popsicle Bridge over Sand Creek. Sand Creek: This new bike path follows the new Sand Creek Byway, and is accessed near the overpass to Sandpoint City Beach. Our area's burgeoning network of bike paths is the vision of North Idaho Bikeways, a group that formed in 1994. Click to see a map of the trails. Laughing Dog Brewing Co. opened in 2005 and brews several styles of beer in Ponderay. Tours and tastings, plus a gift shop are open daily, from 11 a.m. to 6 p.m. Monday through Saturday and from 11 a.m. to 5 p.m. on Sunday. Located just off Highway 95 at 1109 Fontaine Dr. near the Bonner Mall. 208-263-9222. Also see brewing in action at MickDuff's Beer Hall, 220 Cedar St. Schedule a tour in advance at 208-209-6700. - Highway 2/41 Pend Oreille River Scenic Route, west on Highway 2 from Sandpoint through historic Priest River and Newport/Oldtown; then south on Highway 41 through the Blanchard Valley all the way to the Spokane River. - Wild Horse Trail Scenic Byway, 48 miles on Highway 95 from Sandpoint north following Kootenai Tribe’s historic path on the east side of Selkirk Mountains all the way to Canada. Available at the Greater Sandpoint Chamber Visitor Center. - Selkirk Loop is a 280-mile drive through the majestic Selkirks of Idaho, Washington and British Columbia, Canada. More than 55 lakes, including Lake Pend Oreille, on the tour. SelkirkLoop.org; 888-823-2626. - Pend Oreille National Scenic Byway, 33.4 miles of spectacular water views on Highway 200, meandering east to the Montana state line along the rocky shores of Lake Pend Oreille. The Albeni Falls Dam offers four daily tours free for the public from Memorial Day through Labor Day, on the Pend Oreille River on Highway 2 just west of Priest River. 208-437-3133. From May to October, the Sandpoint Farmers Market holds an open-air market of fresh produce, garden starts, handcrafts, flowers, live music and food at Farmin Park from 9 a.m. to 1 p.m. Saturdays and 3 p.m. to 6 p.m. Wednesdays. 208-265-5250. Sandpoint West Athletic Club, 1905 W. Pine St, has all the trimmings: 25-meter indoor pool, outdoor recreation area, racquetball, wallyball, basketball, weight training, stair machine, bikes and rowing machines, treadmill, aerobics, sauna and spa. Daily rates available. 208-263-6633. Also, Natural Fitness at Superior and Ella has a complete line of cardiovascular, weight and circuit machines. 208-263-0676. There are numerous good places to ride your own trail horse; following are some hosted riding possibilities. - Closest to Sandpoint, Mountain Horse Adventures treats riders to leisurely horseback tours through rich mountain forests and alpine meadows on Schweitzers trail system, 11 miles from downtown; 208-263-TROT or 800-831-8810. 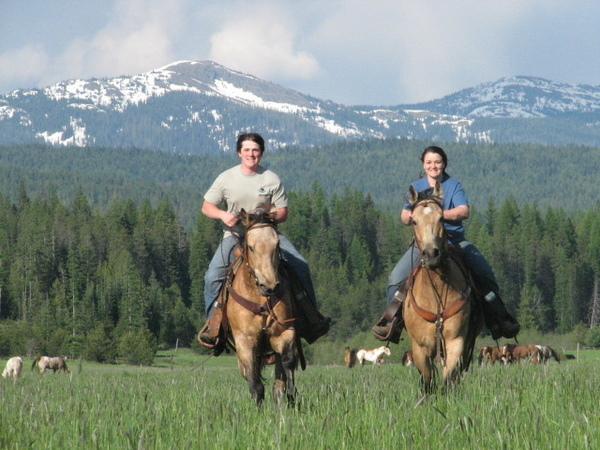 - The 960-acre Western Pleasure Guest Ranch is 16 miles northeast of Sandpoint with lots of trails on the ranch and adjacent national forest. Western Pleasure also has lodging in log cabins, or in the ranch's impressive master lodge. 208-263-9066. - The Diamond T Guest Ranch right alongside the Clark Fork River east of Clark Fork, has lots of riding trails on its 132 acres of forest and meadows; horse rentals are offered nearby, but inquire first. Lodging on the ranch is available in six log cabins. 208-266-0490. Lake Pend Oreille is 43 miles long, with a whopping 111 miles of shoreline. The best way to see the lake is to get on the lake. A number of options are possible. If you don't have your own watercraft, many businesses rent numerous kinds of boats. See the listings for rental places in the Sandpoint Online Lake Guide. If you would like to be part of a tour, consider Lake Pend Oreille Cruises' beautiful, old-style vessel, the Shawnodese, a 40-foot lake tug hand built by Captain Curtis Pearson. Daily cruises in the summer depart from the Sandpoint City Beach Dock, and in the spring and fall from Kramer Marina in Hope. A number of special public cruises are scheduled as well. Follow the link for a look, or call 208-255-LAKE or 1-888-SANDPOINT. 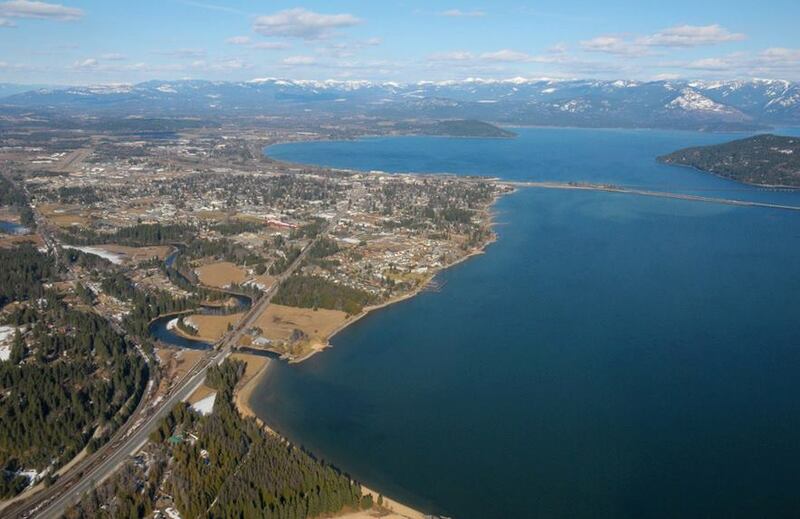 - Sandpoint is one of the West's greatest railroading towns, where the Burlington Northern, Montana Rail Link and Spokane International rail systems all converge to create "The Funnel," an amazingly active rail crossroads with more than 40 trains a day traveling through. Rail buffs come from around the world to see the many trains traveling through. You can sample Sandpoint's rich railroading heritage at the Bonner County Historical Museum at 609 S. Ella; 208-263-2344. For the brochure, "A Railfan's Guide to Sandpoint Idaho," contact the Greater Sandpoint Chamber of Commerce. - The Bird Aviation Museum and Invention Center, 325 Bird Ranch Rd. in Sagle, educates visitors about the historic contributions of aviators and innovators who have helped create modern technology, and celebrate these individuals who have forever changed the way we live. Open in the summer, late May through early October, from 8 a.m. to 4 p.m. Monday-Saturday; in the winter, open early October through mid-May from 8 a.m. to 4 p.m., Monday through Friday. This fine little state park about 10 miles south of Sandpoint remains open year-round for camping, hiking, great fishing for perch and trout, swimming and more. Come winter, it's one of the best recreation areas around, with ice fishing, skating, sledding, cross-country skiing and (on many weekends) a toasty bonfire to warm up at. 208-263-3489. Pend Oreille is ideal for sailing. To learn more, see the sailing page in our Lake Guide. Schweitzer. Ranked nationally in the top 32 resorts by both Ski and Snow Country magazines, Schweitzer Mountain Resort is an award-winning winter retreat with the best skiing, snowboarding and views in the Inland Northwest. Come stay at the luxurious Selkirk Lodge with its outdoor pool and spa. Ride 2,900 acres of terrain, from the heart-stoppingly wild trails to those more approachable by beginners. And enjoy a mountain of summer activities, including hiking, mountain biking, huckleberry picking, disc golf, a climbing wall and bungee jump trampoline. Horseback rides and snowmobile and backcountry ski tours are also offered through Mountain Horse Adventures and Selkirk Powder Company. For winter or summer, come experience the beauty of North Idaho's premier alpine resort! 208-263-9555 or 800-831-8810. The Northwest's largest theme park, located 25 miles south of Sandpoint on Highway 95, Silverwood Theme Park includes admission to Boulder Beach Water Park, so visitors get two parks for the price of one during Boulder Beach operating season. The park features Tremors, a 60-mile-per-hour underground roller coaster, plus Timber Terror and the Corkscrew. Ride a vintage steam train, challenge a gigantic wave pool and monster waterslides, or enjoy live entertainment. Silverwood has more than 80 rides, shows and attractions. 208-683-3400. Travers Park, 1900 block of West Pine Street about a dozen blocks from downtown, has four public tennis courts, and host most of the formal tennis action in town. Public tennis courts are available outdoors at Sandpoint City Beach, where the lake is but a few steps away for a refreshing post-game swim, and Lakeview Park on Ontario Street next to War Memorial Field. The Pedestrian Long Bridge is perfect for a walk or bike ride; reach the bridge via the bike path on the south edge of the city limits. You can always expect dazzling views of the lake and Selkirk Mountains. Other possibilities are Travers Park on the 1900 block of West Pine Street, and City Beach downtown, where the city keeps bike paths open for walking and bicycling. The paved path to Dover along Highway 2 is another fine path for bicyclists or walkers. For a bit more adventure along the lake side right from downtown, follow the rough road on the north side of the City Breakwater, which leads past the city water treatment plant on north and east two miles to Ponderay. This road is only an unmaintained track, but offers solitude along the lake. For more ambitious endeavors, consider a dayhike to Mickinnick or Gold Hill - visit the Hiking and Mountain Biking Trails page for details. With more than 2,000 acres, the Kootenai National Wildlife Refuge, 30 miles north of Sandpoint near Bonners Ferry, has plenty of habitat for an abundance of wildlife. The refuge has developed hiking trails and blinds where waterfowl can be viewed, but one of the best things to do there is take the auto tour through the ponds. Stay in your car and the waterfowl wont take alarm, so the viewing is excellent. In autumn, the refuge plays host to literally tens of thousands of ducks, geese and swans migrating down the Pacific Flyway. Some hearty waterfowl winter over. Summer residents include bald eagles, rough-legged hawks, herons, geese and ducks. With luck, you may spot elk, deer, moose or bear. Auto tour routes are open daily except for the hunting season in October-November. A trail near the office and an area on the auto route are handicapped-accessible. Theres also a nice short hike to a scenic falls on Myrtle Creek. 208-267-3888. Pend d'Oreille Winery, Idaho's 2003 Winery of the Year and 2005 SBA Small Business of the Year, has award-winning wines and unique gifts for home and garden. The wine bar features live music on Fridays and Saturdays, while wine tasting, wine sales and tours of the winery and gift shop are open daily. Located at 301 Cedar St. in downtown Sandpoint. 208-265-8545.